Once per year, you go to your primary care physician for a physical exam, right? The point of this annual doctor visit is to check your body temperature, weight, blood pressure, and other vital signs to be sure there are no otherwise undetected problems with your physical health. But what about a financial checkup? Do you get one of those on a periodic basis? 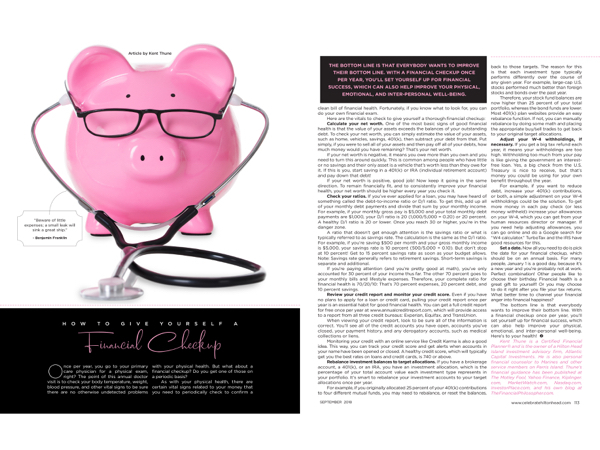 As with your physical health, there are certain vital signs related to your money that you need to periodically check to confirm a clean bill of financial health. Fortunately, if you know what to look for, you can do your own financial exam. Calculate your net worth. One of the most basic signs of good financial health is that the value of your assets exceeds the balances of your outstanding debt. To check your net worth, you can simply estimate the value of your assets, such as home, vehicles, savings, 401(k), then subtract your debt from that. Put simply, if you were to sell all of your assets and then pay off all of your debts, how much money would you have remaining? That’s your net worth. If your net worth is negative, it means you owe more than you own and you need to turn this around quickly. This is common among people who have little or no savings and their only asset is a vehicle that’s worth less than they owe for it. If this is you, start saving in a 401(k) or IRA (individual retirement account) and pay down that debt! If your net worth is positive, good job! Now keep it going in the same direction. To remain financially fit, and to consistently improve your financial health, your net worth should be higher every year you check it. Check your ratios. If you’ve ever applied for a loan, you may have heard of something called the debt-to-income ratio or D/I ratio. To get this, add up all of your monthly debt payments and divide that sum by your monthly income. For example, if your monthly gross pay is $5,000 and your total monthly debt payments are $1,000, your D/I ratio is 20 (1,000/5,000 = 0.20) or 20 percent. A healthy D/I ratio is 20 or lower. Once you reach 30 or higher, you’re in the danger zone. A ratio that doesn’t get enough attention is the savings ratio or what is typically referred to as savings rate. The calculation is the same as the D/I ratio. For example, if you’re saving $500 per month and your gross monthly income is $5,000, your savings rate is 10 percent (500/5,000 = 0.10). But don’t stop at 10 percent! Get to 15 percent savings rate as soon as your budget allows. Note: Savings rate generally refers to retirement savings. Short-term savings is separate and additional. If you’re paying attention (and you’re pretty good at math), you’ve only accounted for 30 percent of your income thus far. The other 70 percent goes to your monthly bills and lifestyle expenses. Therefore, your complete ratio for financial health is 70/20/10: That’s 70 percent expenses, 20 percent debt, and 10 percent savings. Review your credit report and monitor your credit score. Even if you have no plans to apply for a loan or credit card, pulling your credit report once per year is an essential habit for good financial health. You can get a full credit report for free once per year at www.annualcreditreport.com, which will provide access to a report from all three credit bureaus: Experian, Equifax, and TransUnion. When viewing your credit report, look to be sure all of the information is correct. You’ll see all of the credit accounts you have open, accounts you’ve closed, your payment history, and any derogatory accounts, such as medical collections or liens. Monitoring your credit with an online service like Credit Karma is also a good idea. This way, you can track your credit score and get alerts when accounts in your name have been opened or closed. A healthy credit score, which will typically get you the best rates on loans and credit cards, is 740 or above. Rebalance investment balances to target allocations. If you have a brokerage account, a 401(k), or an IRA, you have an investment allocation, which is the percentage of your total account value each investment type represents in your portfolio. It’s smart to rebalance your investment accounts to your target allocations once per year. For example, if you originally allocated 25 percent of your 401(k) contributions to four different mutual funds, you may need to rebalance, or reset the balances, back to those targets. The reason for this is that each investment type typically performs differently over the course of any given year. For example, large-cap U.S. stocks performed much better than foreign stocks and bonds over the past year. Therefore, your stock fund balances are now higher than 25 percent of your total portfolio, whereas the bond funds are lower. Most 401(k) plan websites provide an easy rebalance function. If not, you can manually rebalance by doing some math and placing the appropriate buy/sell trades to get back to your original target allocations. Adjust your W-4 withholdings, if necessary. If you get a big tax refund each year, it means your withholdings are too high. Withholding too much from your pay is like giving the government an interest-free loan. Yes, a big check from the U.S. Treasury is nice to receive, but that’s money you could be using for your own benefit throughout the year. For example, if you want to reduce debt, increase your 401(k) contributions, or both, a simple adjustment on your W-4 withholdings could be the solution. To get more money in each pay check (or less money withheld) increase your allowances on your W-4, which you can get from your human resources director or manager. If you need help adjusting allowances, you can go online and do a Google search for “W4 calculator.” TurboTax and the IRS have good resources for this. Set a date. Now all you need to do is pick the date for your financial checkup, which should be on an annual basis. For many people, January 1 is a good day, because it’s a new year and you’re probably not at work. Perfect combination! Other people like to choose their birthday. Financial health is a great gift to yourself! Or you may choose to do it right after you file your tax returns. What better time to channel your financial anger into financial happiness? The bottom line is that everybody wants to improve their bottom line. With a financial checkup once per year, you’ll set yourself up for financial success, which can also help improve your physical, emotional, and inter-personal well-being. Here’s to your health!